Unusual car collection in Nashville, Tennessee has more European and crazy-one-of-a-kind cars than other car museums which I have seen. Lane Motor Museum, Nashville, Tennessee. Rita took this panorama with her iPhone. 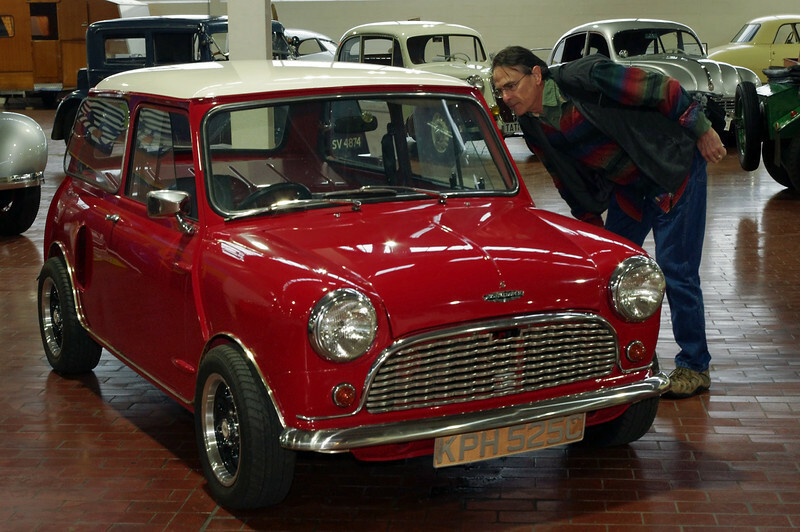 Gary checks out the Austin Mini at the Lane Motor Museum in Nashville, Tennessee. This is actually a replica of a 1965 car modified by John Cooper. He put two engines in it, front and rear. The car was fast, and well balanced, but an engine failure caused a rollover crash in which Cooper was hurt, and he abandonded the concept. 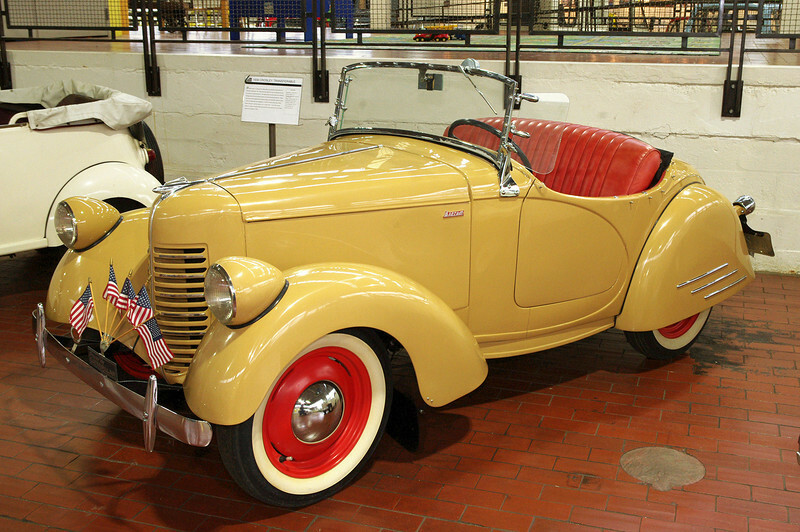 1940 American Bantam Roadster; Lane Motor Museum, Nashville, Tennessee. From 1930-1934 the American Austin Car Company made cars based on the English Austin 7 chassis. Reorganized in 1936 as the American Bantam Car Company. The Bantam bodies were designed by Alexis de Sakhnoffsky and made by the Hayes Body Company of Detroit, with final assembly in Butler, Pennesylvania. 1967 Morris Mini-Minor Traveller. Lane Motor Museum, Nashville, Tennessee. In the 1950s, Morris merged with its old rival Austin to form British Motor Corp. Economic factors in the UK in the mid-1950s made the creation of “a proper miniature car” a priority, and BMC assigned a small team of designers to the task. Alec Issigonis led the design team. Mini was introduced in 1959, to wild acclaim. The popularity of the Mini spawned many models that targeted different markets. 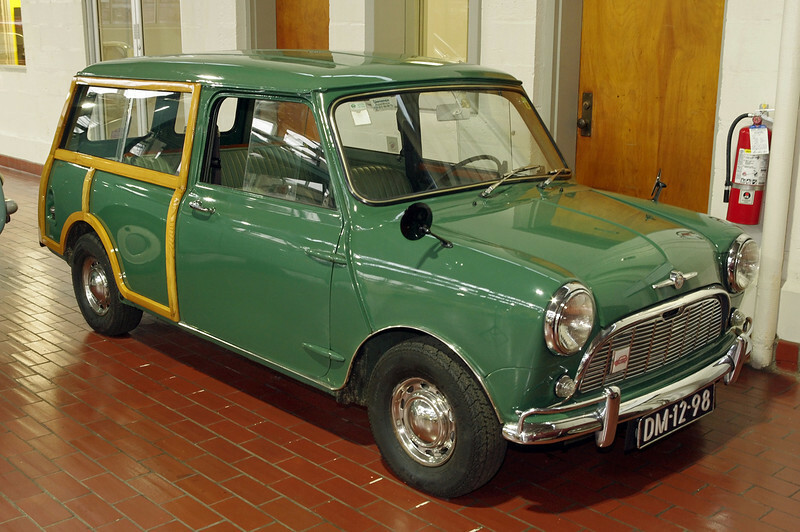 The Mini Traveller, a two door station wagon with double “barn-door” style rear doors, was designed for carrying. The luxury model you see here has wood inserts in the rear body. This left-hand drive Mini was designed for export. 1989 Nissan Figaro; Lane Motor Museum, Nashville, Tennessee. Built by a Nissan special projects group called Pike Factory (which was not really a factory - more of a design group). 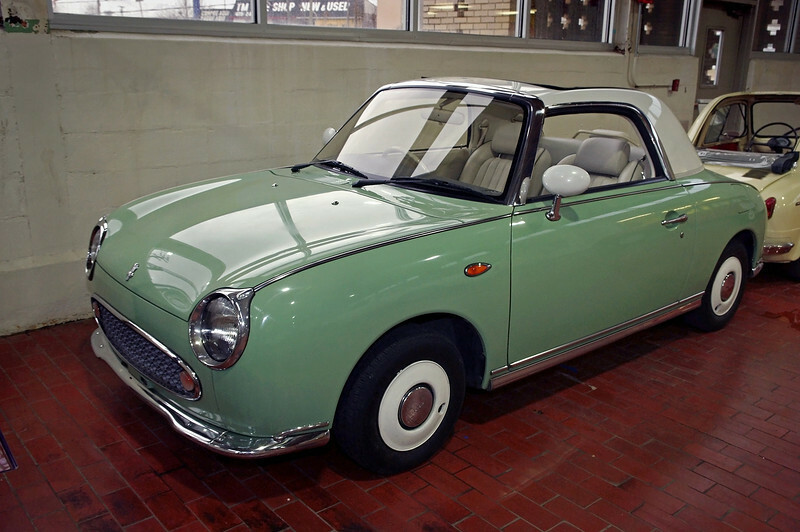 The Figaro, which was sold without the Nissan name, was designed by Shoji Takahashi, who won a design competition with the car. Only 8000 were originally available with an additional 12,000 added to production numbers to meet demand. Prospective purchasers had to enter a lottery to be able to buy one of these cars. 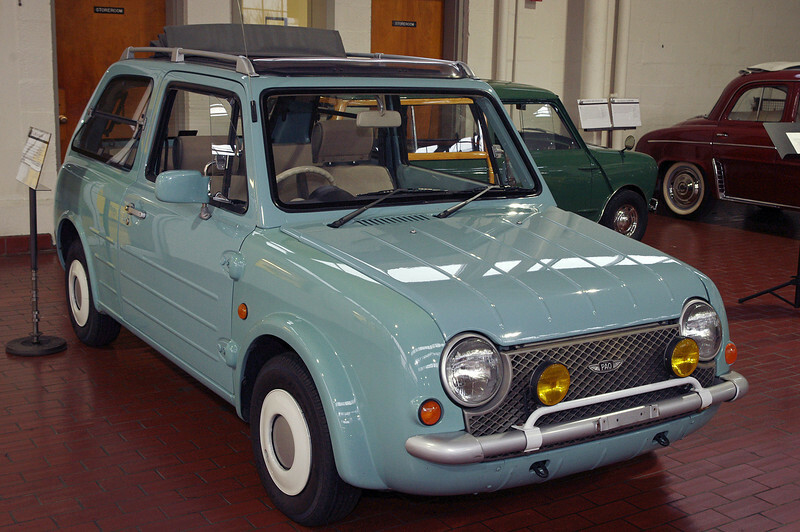 Nissan Pao; Lane Motor Museum, Nashville, Tennessee. The Pao was sold without the Nissan name and only by reservation from January 15 through April 14, 1989. The Pao sold out in 3 months and remains a sought after and collectible car, with only about 51,657 made. Part of Nissan's "Pike" series, it was designed as a retro fashionable city car. It included external door hinges like the original 1960s Austin Mini which had become fashionable in Japan, 'flap-up' windows like those of a Citroën 2CV, and a split rear tailgate of the first British hatchback car the Austin A40 Farina Countryman. "Although it bears the name of the famous aircraft builder–Willy Messerschmitt–he had little to do with the car’s design. Fritz Fend designed the car, and it was built at Messerschmitt’s factory which was restricted from building airplanes after World War II. This car appealed to motorcyclists who wanted more weatherproof transportation and to customers who found it cost half the price of a Volkswagen." 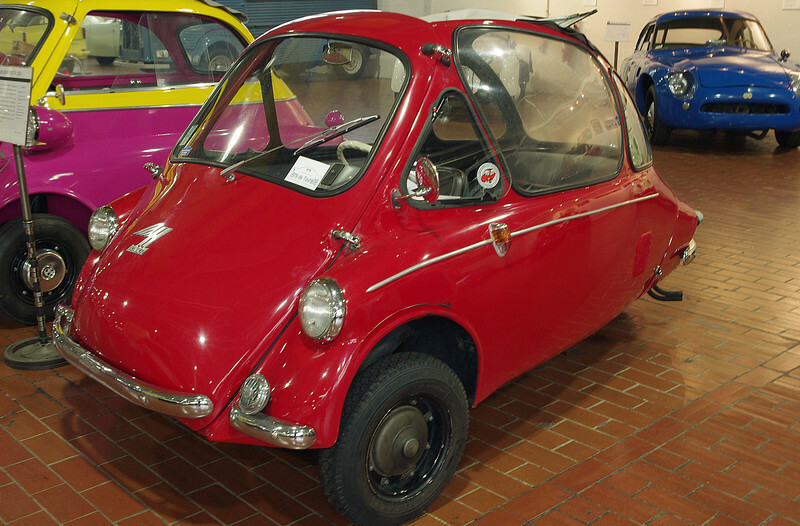 1956 Heinkel. Lane Motor Museum, Nashville, Tennessee. Heinkel, like Messerschmitt, was prohibited from making aircraft after WW2. 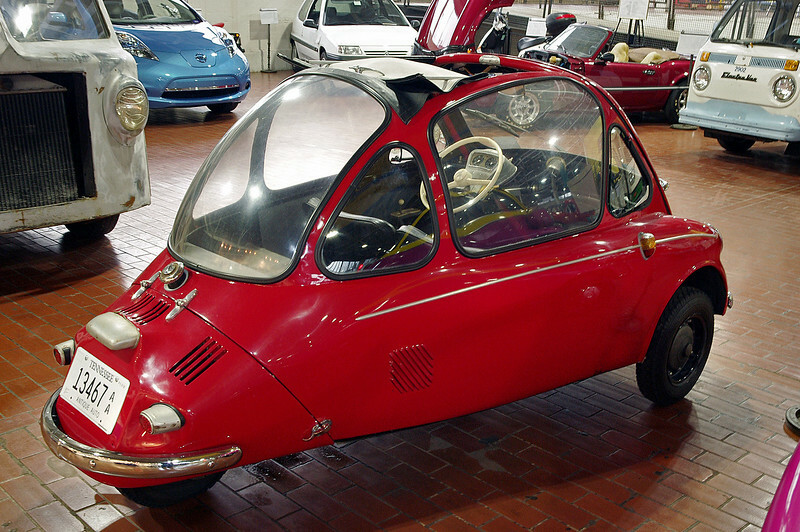 Heinkel started producing bubble cars in 1956. 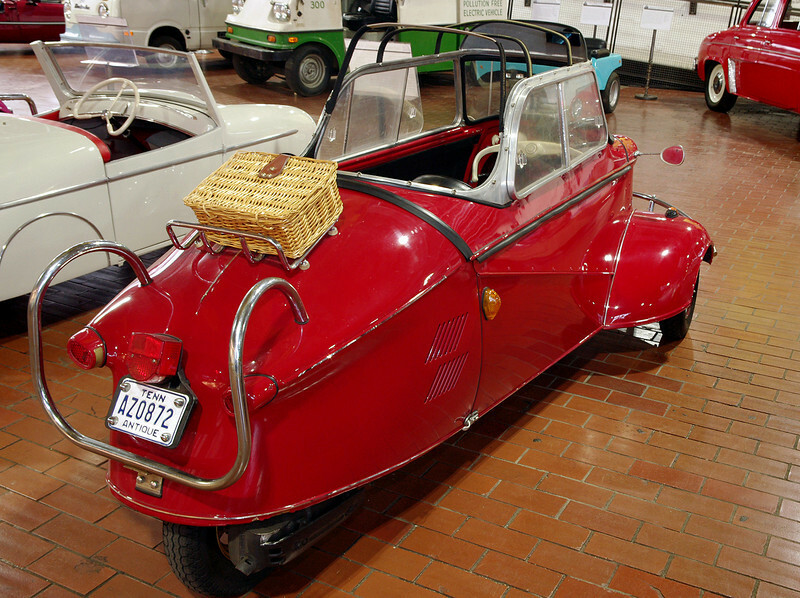 This particular car won the "under 200 cc" class in a 1200 mile Microcar rally from Liege, Belgium to Brescia, Italy, and back (2008). Lane museum owner Jeff Lane drove the car, with the car's owner Claude Gueniffey navigating. After driving it flat out for 6 days and 10 hours, Jeff Lane says he was impressed with the car's engineering. Claude donated the car to the museum in 2012. Heinkel stopped production in 1958, but sold the license to Trojan in Ireland where they were made until 1965. Heinkel, like Messerschmitt, was prohibited from making aircraft after WW2. 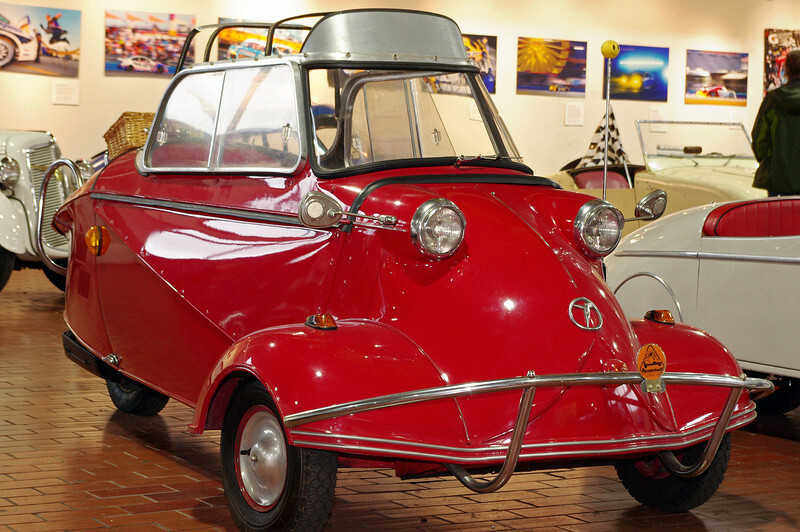 Heinkel started producing bubble cars in 1956. This particular car won the "under 200 cc" class in the 1200 mile Microcar rally from Liege, Belgium to Brescia, Italy, and back (2008). Lane museum owner Jeff Lane drove the car, with the car's owner Claude Gueniffey navigating. After driving it flat out for 6 days and 10 hours, Jeff Lane says he was impressed with the car's engineering. Claude donated the car to the museum in 2012. "The 4CV symbolizes Renault's rebirth following massive bomb damage during World War II. Following development work conducted under cover during the German occupation, the 4CV was finally unveiled to the public at the first post-war Paris Motor Show. It was an immediate success, as it became the symbol of new-found liberty after five years of bitter conflict. 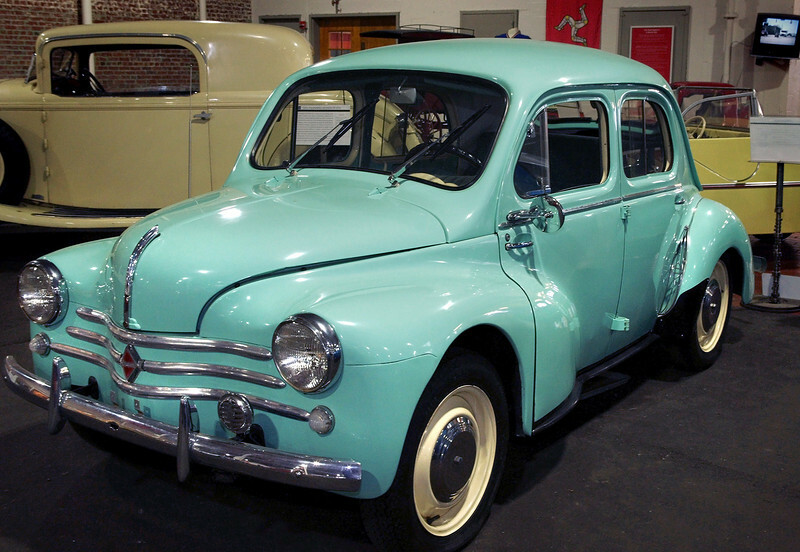 The 4CV, launched in 1946, was the first French car to top production of a million units and is one of the smallest 4-door saloons ever made. 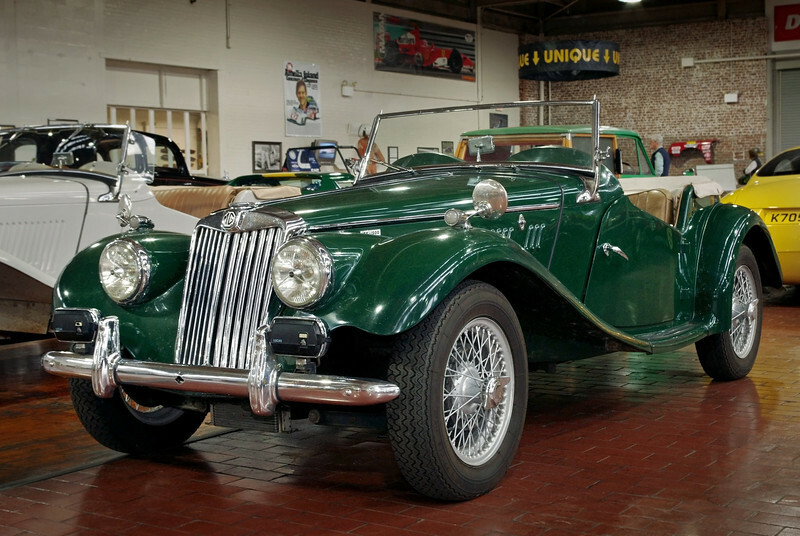 Length: 10' 8" width: 4' 6" height: 4' 4" weight: 1,232 pounds"
"In 1949, the MG TC gave way to the MG TD; in 1953, the MG TD gave way to the MG TF. The TF was at the time a rather unsuccessful attempt to stall the impatient car enthusiasts who had started to get tired of the long series of the T-type and were crying for something new. 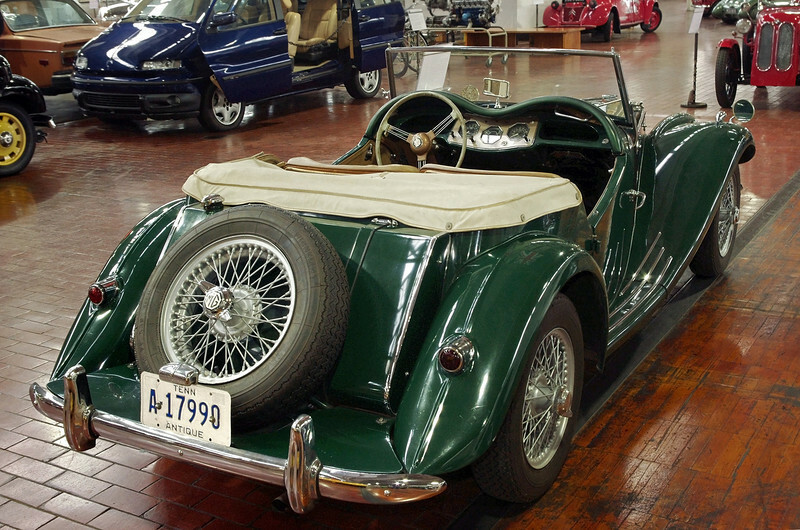 Hence, the TF became a short production series before the MGA was released. It was basically a cosmetic modification of the TD but had a more modern look, with a more inclined radiator and built-in head lamps. In hindsight, the TF turned out to be perhaps the most beautiful of all the MG models." When he was a teenager museum owner Jeff Lane received this car as a gift from his father - in pieces. Jeff restored it over a period of years and finally took his driver's license road test in it.